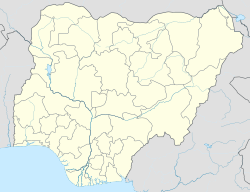 The Kontagora Emirate is a traditional state with the capital city of Kontagora, Niger State, Nigeria. Kontagora is made up of territory originally divided between various minor chiefdoms (Aguarra, Dakka-Karri, Kambari, Dukawa, and Ngaski) which were conquered by the Fula people between 1858 and 1864, and turned into the emirate of Kontagora, a dependency of the Sokoto Caliphate. Following a well-armed attack, starting on 31 January 1901, the emirate fell under British rule, becoming a province first in the British Protectorate of Northern Nigeria and then in the British colony of Nigeria, until independence in 1960. Kontagora now consists of Kontagora emirates, containing the chiefdom of Wushish, the territories of Sarkin Bauchi, and the chiefdom of Kagara, all administratively grouped into the Mariga, Magama, and Rafi Local Governments.